Shocking confession time - would you believe, until these two items dropped through the letterbox at Fluffy Towers, I had never tried a single Inglot product? I know, it amazes me too. The Polish brand, who have just celebrated the first anniversary of their Jervis Centre shop, are widely known for their excellent quality and good value. I've heard rumours that the products are really similar to MAC's and the shade choice is amazing - currently Inglot offer 200 nail polish shades, over 200 shades of eye shadow, and 150 colours of lipstick. That's as well as their really popular Freedom system, where you can customise your own make-up palette. I've been playing about with the AMC Multicolour System Face & Body Matte powder in #92, part of the brand's most recent Hawaiian Bar collection. Apparently these can be used all over the face and body though with the shade selection I think I will get most use out of this on my cheeks. There are five shades of coral, peach, pink and brown which you swirl together for a pretty, peachy glow. It's a lovely smooth powder that is talc-free, enriched with vitamin E and lasts really nicely on the skin. These are €22. I also received a Freedom blush refill in shade #9, a gorgeous bright pink. I was wary of the colour at first as it's very pigmented - more so than the Face & Body powder - and sometimes these types of shades can be tricky to blend. Not this one, though - it's easy to work with, blends out nicely and lasts all day. So far I've stored it in its plastic case but I plan to purchase an empty palette (€12) and three other blush shades (€9 each) to fill it up and keep this one company! What else should I investigate? If you've tried any of their products, I'd love to know your thoughts. Oh, and psst! Heading to Electric Picnic this weekend? Inglot are offering a Festival Fever makeover, which includes a nail polish, Lip Defence with SPF 25, cream powder and wipes along with a long lasting festival make-over, including false lash application. It's €50 and can be booked in any store. I've had this block in the past- I love how its matt because so many bronzer products have shimmer in them! Inglot nail polishes are great too- they go on and last like more expensive brands! I have an even worse confession Emma, I've never even heard of Inglot. The colours look lovely. Great colours. I only have a couple of inglot eyeshadows as I have to traipse to the other side of London to get to their shop. Have to say though the quality is fantastic! The Freedom palette blush is gorgeous! You should definitely get an eyeshadow freedom palette. I can't live without mine now! These colors are gorgeous! 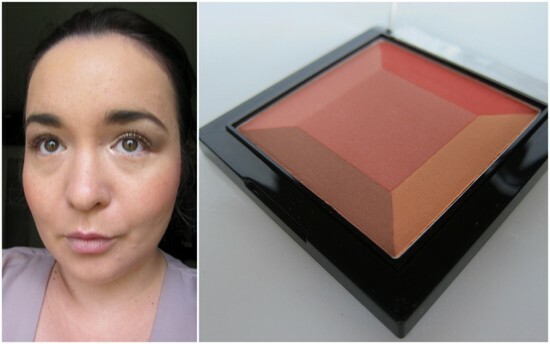 I love NARS blush, but I should try something different. Wow, love those colors--what a wonderful surprise! Hope you have a lovely weekend! That blush colour is SO pretty!